Existing prebuilt templates are not for you, aren’t they? Need something unique? Just let us know and we will apply our front-end experience to your project using the best Magento practices. 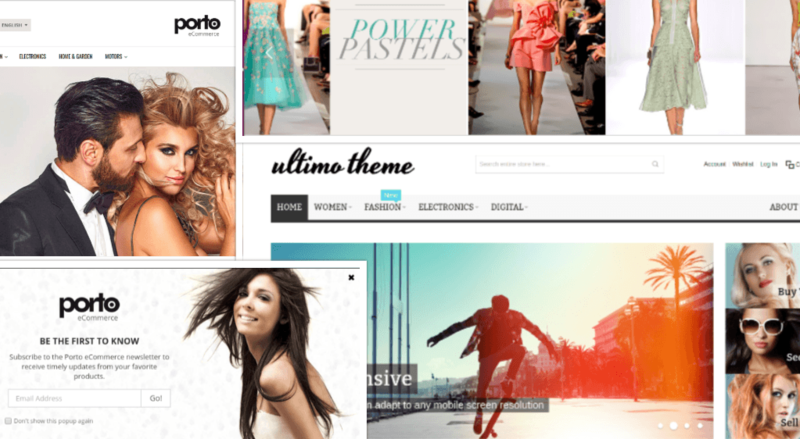 Magento allows to use a default template, develop a custom theme or install the prebuilt themes. The most widely used Magento prebuilt themes are Ultimo (it is used for both Magento 1 and 2; standard license $99 covers 6 month support), Porto (standard license $99 covers 6 month support; Porto 2 is compatible with Magento 2) and Milano (standard license $94 covers 6 month support; not compatible with Magento 2 yet). As the above mentioned themes are very popular and used by many online sellers, you will have no issues with them, they are upgraded easily along with new versions of Magento, and many extensions can be easily integrated into these themes. Every above mentioned template option has its own pros and cons, such as cost, SEO friendly structure, UI/UX, duration, loading speed, etc. If you don’t know what particular option is the best for your webstore, please contact us for more details or additional info.